“Based on such improvements, we have judged that it is now the right time to find a new private owner for DSME,” the KDB chief said. 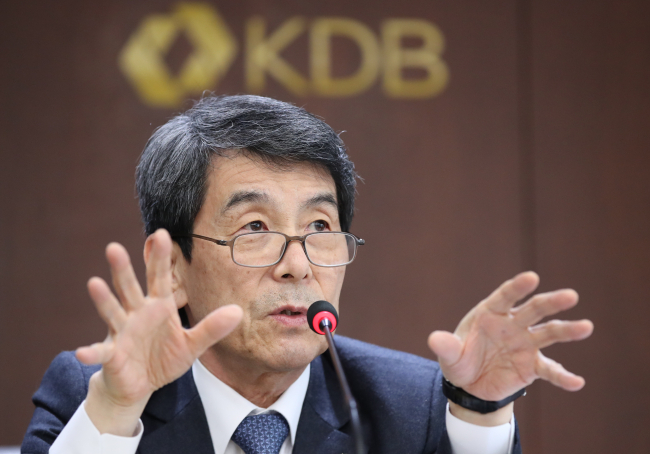 KDB’s blueprint is to prevent the nation’s second-largest shipbuilder from being sold to a foreign entity and to reorganize the country’s shipbuilding industry into a “big two” frame. “In order to fundamentally enhance the competitiveness of the industry, it is crucial to eliminate the inefficiency caused by overlapping investment under the current big three structure,” Lee said, limiting potential DSME bidders to Hyundai Heavy and Samsung Heavy. DSME’s labor union immediately lashed back, claiming that a takeover by a local competitor will lead to massive layoffs. Financial authorities also approved of the undergoing selloff for the long-distressed shipbuilder. “The takeover, should it proceed as planned, will alleviate the oversupply and consequent depreciation in the shipbuilding industry,” said Choi Jong-ku, chairman of the Financial Services Commision. Meanwhile, Hyundai Heavy’s labor union also expressed unease as the company has temporarily closed its Gunsan shipyard in Northern Jeolla Province amid the prolonged industry slump. Unionists, as well as the Gunsan local government and communities, argue that the acquisition of DSME -- which has a yard in Geoje, South Gyeongsang Province -- may drive the company to totally abandon the suspended Gunsan business.